Each vacuum island base including interior frame and vacuum platform is constructed of stainless steel in order to give you a long standing product that looks new for years. 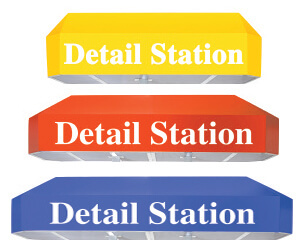 Each base has a unique modular design constructed for easy set up. Double vacuum island bases consist of three separate pieces and single vacuum island bases consist of two separate pieces. 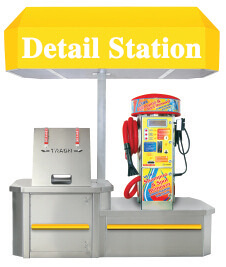 This enables you to set up the whole car wash base without a forklift in less than two hours, and you don’t have to replace the whole unit if a section gets damaged. Each vacuum island canopy has a unique two-piece design which is more cost effective to ship. The canopy features aluminum frame, poles and vinyl cover that makes it lightweight, durable and weather resistant. 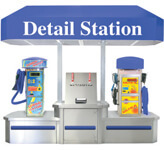 You can even customize the vacuum island canopy for an additional fee. 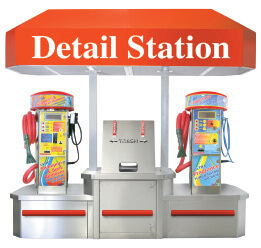 We provide single or dual boom bay packages for self car wash.
Our car wash meter equipment and systems are dependable and simple to own and operate. Our goal is to help every operator build a successful operation. We hope you will come to think of us as your "total" car wash industry supplier.